LAMBDA's unique tubing compressing mechanics reduces pulsation and is very gentle to the tubing. No clamps, fixings or stoppers are required to hold the tubing in place. This leads to a long tubing life and the long term stability of flow rates even with low cost tubing. 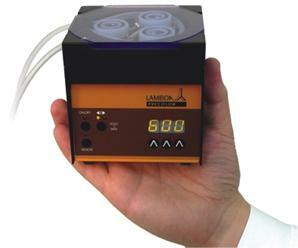 The tubing economy is such that the LAMBDA PRECIFLOW peristaltic pump is paid back after the use of only 80 m of tubing. Thus, this is the only pump on the market, which saves more money than it costs! It is the most compact peristaltic pumps of this type on the market with large range of flow rates from 0.01 to 10,000 ml/hour. Select the feed pump and harvest pump according to your culture growth rate. Flow rate programming and fixing the tubing on the pump head is so simple! Easy to set up and comfortable to work with! Flow rate programming (up to 99 steps) and automatic switch-on and switch-off without using any timer. The maximum flow rate has been increased to up to 10 000 ml/hr (10 lph). To achieve such a high flow rate in such a small instrument new motor technology has been used. Q = f(t), where f(t) defined by the user. It is a big temptation for any producer of fermenters and bioreactors to decrease the unit cost by supplying low cost, fixed speed peristaltic pumps using only one size of tubing. Often such pumps are not reliable and the users finally don't use them and buy additional external pumps instead. Recently, even low-cost "nut-shell dimension" peristaltic pump heads have appeared on the market. LAMBDA disagrees with these trends, because the peristaltic pump quality and reliability is a crucial factor, which strongly affects the quality and productivity of the cell culture work. Thus, the economy on low cost peristaltic pumps is a very bad one! peristaltic pump defect the financial and time loss will be so elevated that dozens of high quality pumps could be bought with it. After having made a lot of bad experiences with many commonly available peristaltic pumps, LAMBDA developed new peristaltic pumps with special mechanics, which is gentle to the tubing. As a consequence the lifetime of the tubing (even lowest cost silicone tubing) is greatly extended and the flow rates remain constant for several weeks without the risk of tubing rupture in long term experiments like continuous cultures, chemostat, perfusion. The flow rate of LAMBDA peristaltic pumps can be varied in the ratio 1:1000. For example, during the addition of acid the peristaltic pump turns at full speed and reduces the speed as the preset value of pH is being attained. The regulation by such a "soft landing" is much more precise than by merely switching on and off fixed speed pumps. The worst peristaltic pumps are those which require tubing with stoppers (2-stop or 3-stop tubing) or tubing clamps. This only shows that their mechanics is not good and draws the tubing inside the peristaltic pump head. Moreover, these special tubings are very expensive. LAMBDA peristaltic pumps work well with low cost tubing. The economy obtained by using low cost tubing instead of tubing with stoppers or expensive special tubing material formulations pays the peristaltic pump back after the use of only about 80 m of tubing! With optional RS-232 or RS-485 interface, the pumps could be connected and controlled by a PC via FNet, SIAM or Pnet. 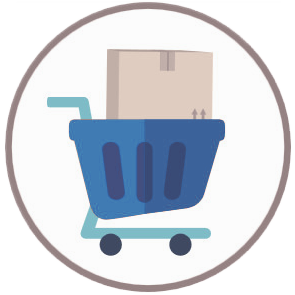 Contact us at support@lambda-instruments.com to get the quotation and prices by email or visit our LAMBDA e-shop for laboratory Peristaltic Pumps.